BRATTLEBORO — The day the girls were leaving Learning Beyond camp and going back to their orphanage in Mumbai, 15-year-old Preema was crying. Kevin O’Keefe asked her why, and she said she didn’t want to leave camp. He told her, “This experience will live in your heart and it will live in my heart. We are going to take this experience with us.” He “heart-styled” making half of a heart with his hands and then she made a half heart with her hands and they looked at each other through their hearts. 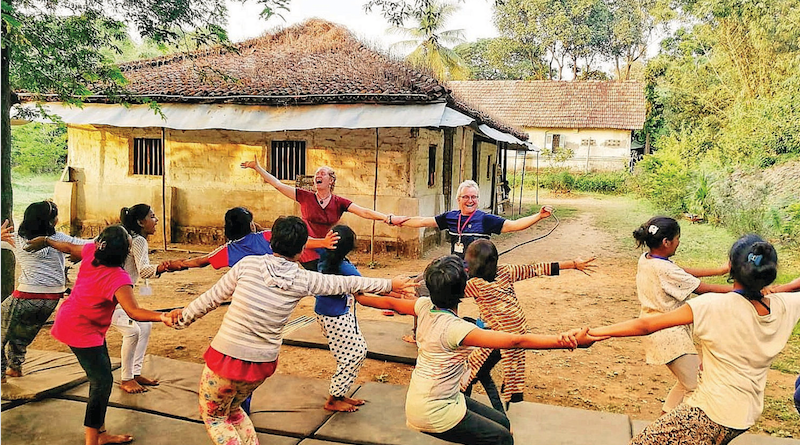 Brattleboro residents Kevin and his wife Erin Maile O’Keefe just returned from a month-long trip to India where they conducted a five-day teacher training in Mumbai to start the first year-round Social Circus program in India. They trained 15 teachers who will continue this work at orphanages in Mumbai and Pune. After the teacher training, they brought those teachers to work for one week in a Diwali camp for orphans. Kevin will return for the next two years and do supplementary trainings and he’s hoping this could be a pilot program which will be replicated at other orphanages. Their trip was entirely funded by 64 local and national donors.